Rotary or any other organization is only as good as the persons supporting the goals. With the diversity of Rotary it is easy to be involved for there are so many areas of interest and concern. This almost final message from me as your President is to thank you for your local and international support of Rotary. And although our attempts to further the membership have met with minimal success so far, we do have prospects and are working on some new ideas for the future. With creative and bold fund raising and your best efforts we have enjoyed a productive and interesting year. Community events, carnival, casino night and an underwriting of the Harlem Ambassadors basketball night have netted us a positive public image. Quietly we have aided Power Up Gambia (a targeted African community power initiative), Reach Out (a mental health and dual diagnosis program center in Morrisville), The Trenton Soup Kitchen (hot food served to the needy), reading to young children (I Like Me books), dictionaries (for third graders), Shelter Boxes (disaster survival equipment), mosquito nets (fighting malaria), Rotoplast (to restore health and dignity), 21st Century Interact projects (right in Morrisville), scholarships as well as Sustaining Memberships and Paul Harris Fellows. The YMCA Strong Kids campaign is now in the forefront of our goals so that more scholarship funds can be made available for Morrisville children so that more can take advantage of the YMCA programs that help build strong bodies and strong minds. How is more money to be found? 1) locate groups willing to listen to presentations by the YMCA Team made up of our own Rotarian Michele Fina, Director of the Morrisville Branch, and YMCA CEO Eric Stark, 2) apply to District 7430 and Rotary International for matching fund grants (grant writers: Michele, Lee Nolting and Axel Augspach) and 3) conduct fund raisers for the cause. We will do what we can. This began as a Thank You and it concludes that way. We are Rotary. What we do matters to many people. Thank you, the members, for your commitments. God gathers the remnants of your life and weaves them into works of dignity and purpose. 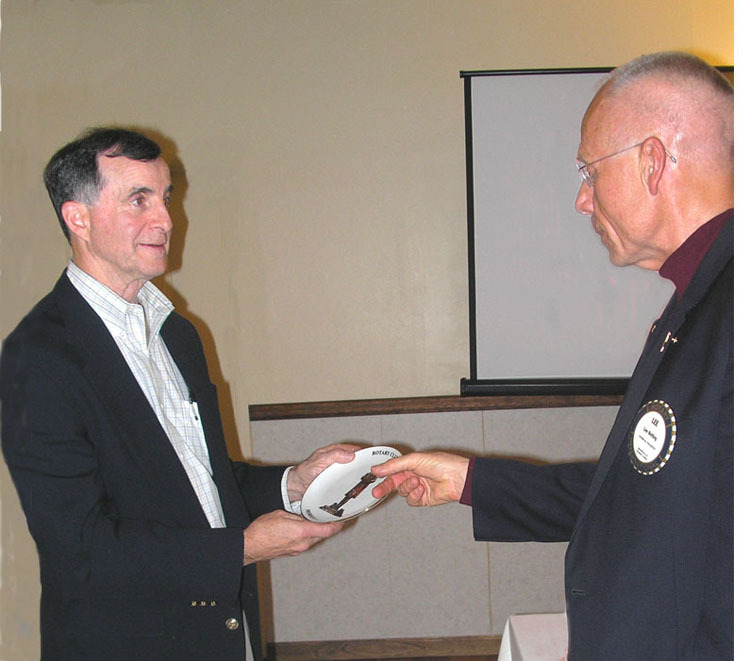 Tom Wynn (shown here with Lee Nolting thanking him for speaking) of the Blue Bell Rotary Club spoke about the important role Shelter Boxes are playing and can play in disasters, both natural and other, around the world. The purpose of the Shelter Box, he explained, is to provide shelter for disaster victims. A rugged 10-person tent and other survival essentials are provided in each box. The box was conceived and developed by a British ex-Royal Navy search and rescue diver, Tom Henderson. Shelter Box is a registered UK charity operated by the Rotary Club of Helston-Lizard, based in Cornwall, England. It was established in 2000 and the first boxes went to India in January, 2001, following a devastating earthquake. ShelterBox USA is a 501(c)3 organization based in Lakewood Ranch, Florida. Tom challenged the club members to 1) become ShelterBox Volunteers and help get out the word through presentations to other organizations, 2) become a ShelterBox sponsor by supporting part or all of the cost of a box., through either a onetime or monthly contribution. A complete box provides ten people with shelter, warmth and comfort for a minimum of six months and can be sponsored for $1000. Every $100 helps shelter one survivor for a minimum of six months. Donations can be sent to ShelterBox USA, 8374 Market Street, #203, Lakewood Ranch, FL 34202. Rev. Bowers, shown with President Barry Vannauker, talked about the challenges she has experienced in working with the poor and disadvantaged in both New York City and Philadelphia. Complexities in the the lives and attitudes of such people and the communities where they live sometimes make it difficult to know how to go about helping. Thanks to Ted Fletcher and Joe Urbano for their effort to support the Morrisville Community Day. 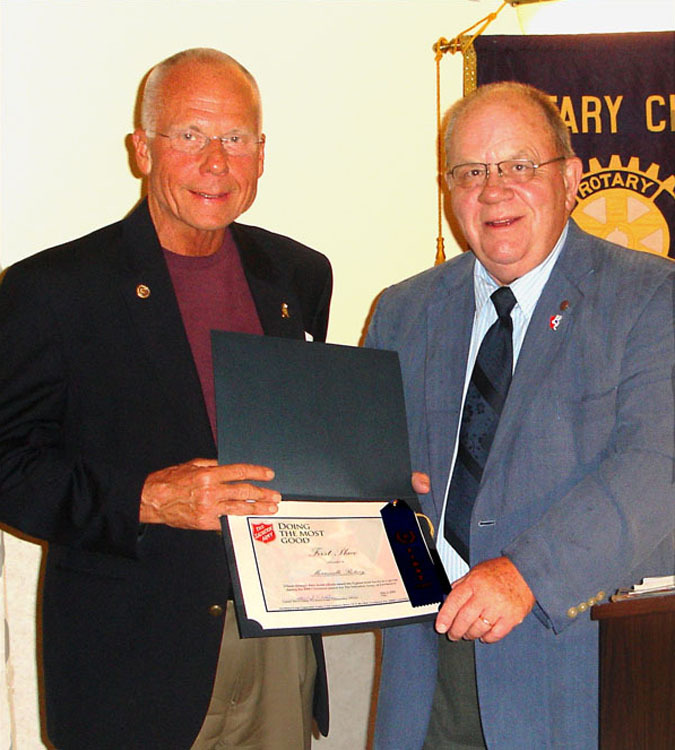 Lee Nolting, one of the two club Rotarians who is on the Advisory Board of the Salvation Army (Tom Miller is the other), presented the First Place award to President Barry Vannauker. 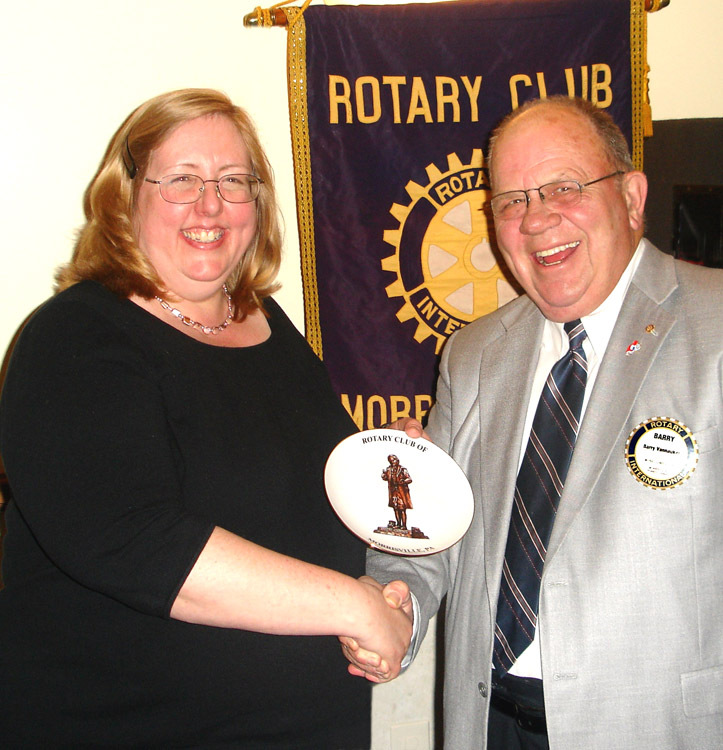 The club raised $3910 through the 2008 Christmas Red Kettle drive, beating out the Marine Corps and the Bristol Rotary Club (Sorry about that, Dave Harris!) Great fun for a very worthy cause. Capt. 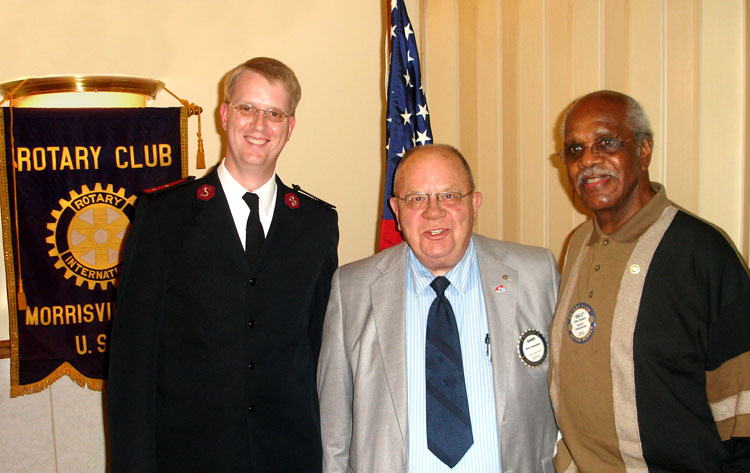 Childs of the Salvation Army in Levittown, shown here with President Barry Vannauker and Rotarian Elias Jennett, talked about the ministries that the Salvation Army sponsors worldwide that change the lives of children and adults, ie. the rehabilitation of people. He also noted that a new Salvation Army Family Store will be opening at the former Frank's Nursery on Route One in Falls Township and the opening of a Kroc Activities Center in Philadelphia. 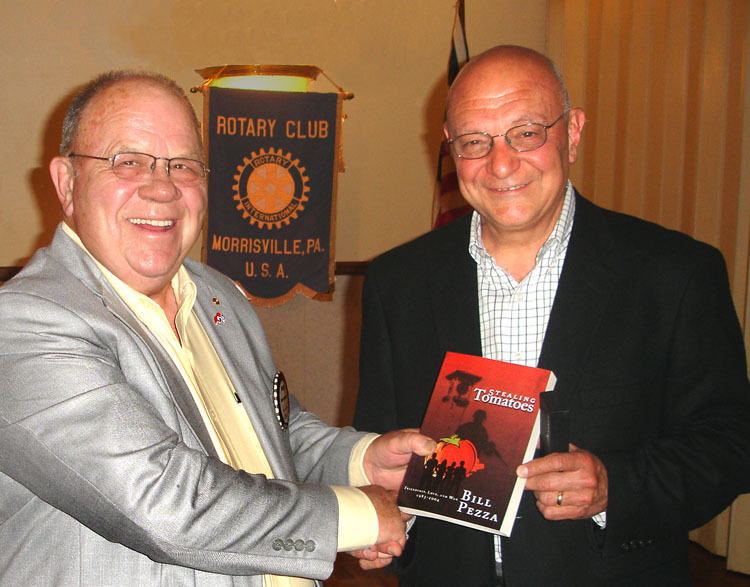 June 4 Bill Pezza, aurthor - "Stealing Tomatoes"
Bill Pezza, shown here with President Barry, spoke to the club last year about his book, Anna's Boys. He has written a sequel, Stealing Tomatoes, and explained that it is a powerful cross-generational story in which survivors of eras gone by pass the torch to a new generation of Americans faced with a different kind of conflict. They find themselves confronted with a diabolical and elusive enemy that knows no national boundry and uses unspeakable tactics. Set in Bucks County, Bill described the book as a sweeping and provacative story of love and conflict with engaging characters whose experiences will cause you to laugh, cry, and, most of all think. Bill has taught history and government for four decades, specializing in interdisiplinary studies and incorporating oral, grass roots history into his work. He currently teaches at Bucks County Community College and resides in Bristol, Pa. This year the club opted to give a Student Achievement Award at the end of the school year to one graduating Morrisville Senior in the amount of $500. Jacob Wallbridge was selected through a nominations process developed last year by Peter Wisnosky and approved by the Board of Directors. Lee Nolting and President Barry Vannauker made the award at the High School's Awards Ceremony. In attendance were students receiving various awards, their parents, guests, faculty and presenters. Lee in his presentation spoke about Service Above Self, the Rotary International motto which also is the motto of the Morrisville club. Thanks to Ted Fletcher and his gang who volunteered to cook the hamburgers and hot dogs for the Morrisville School Faculity Picnic. 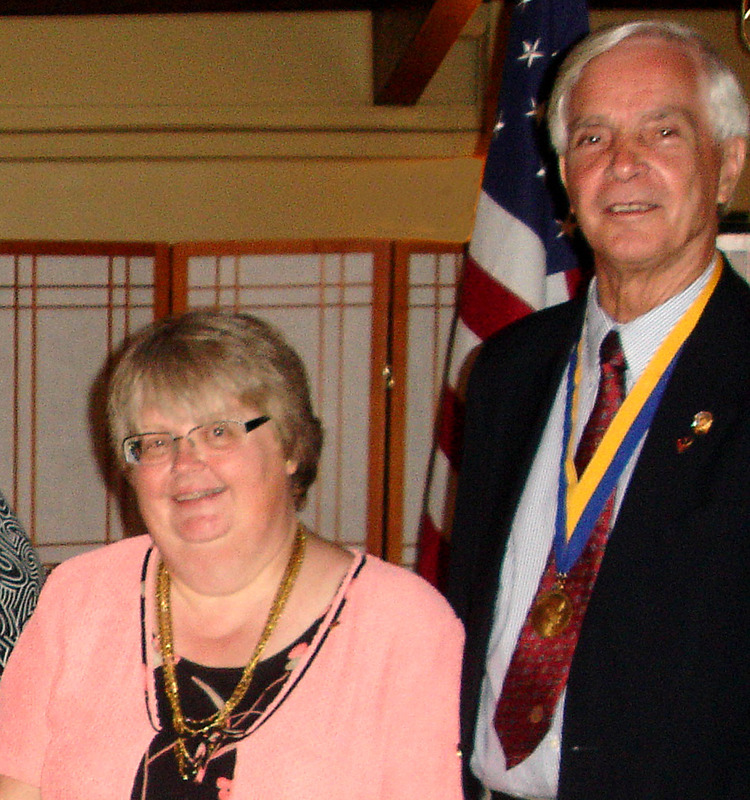 President-elect Axel Augspach talked to the club about his vision for the coming Rotary year. Membership has got to get top priority he said. He said he recognizes that the present state of the economy may limit what the club and what individuals may be able to do. He noted that he is planning to be present as much as possible the coming Rotary year but he has certain family commitments that will require him to be out of the country part of the time. He said that he will be working with Vice President Hal Long to be sure that club plans are carried out as they should be. 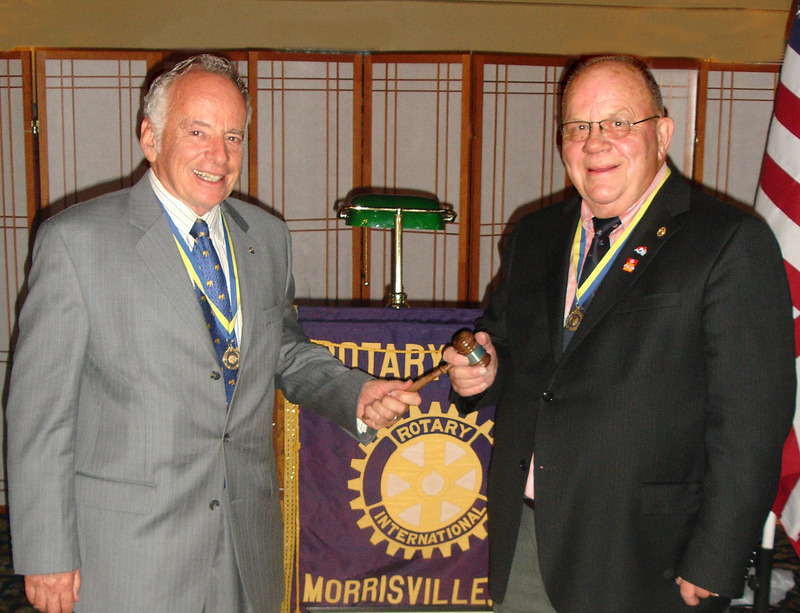 Axel Augspach (left), the incoming President of the Rotary Club of Morrisville receives the gavel from outgoing President Barry Vannauker. The gala party at the Yardley Country Club including the induction of two new members, Linda Lee Yonkin and Pastor Catherine Bowers (of the Morrisville United Methodist Church), seen below with their sponsors. Membership Chair, Andy Thompson, talked about the significant role of women in Rotary, starting with the Women's Auxillary in 1911. Membership to women as Rotarians in the US, however, was not open until a Supreme Court ruling in 1987. Currently there are 168,000 women members of which 2350 are Presidents of local clubs and 51 are District Governors. 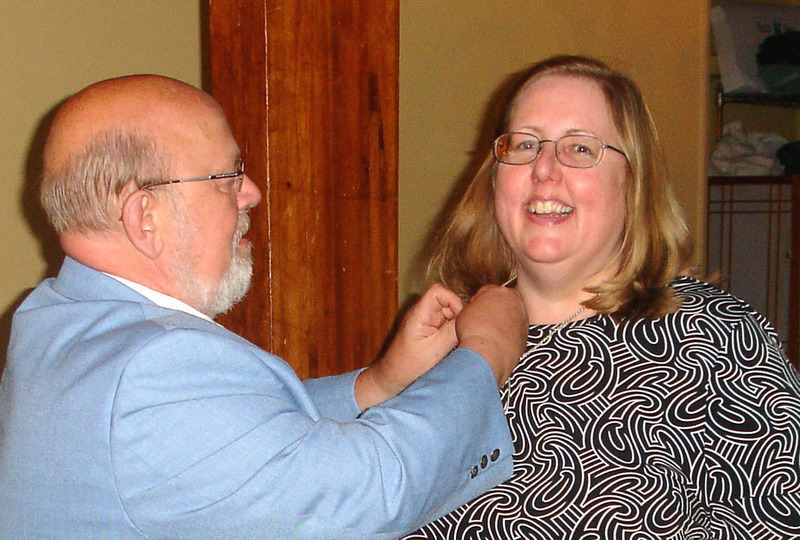 Linda Lee Yonkin and sponsor, Hal Long and Pastor Catherine Bowers receiving her membership pin from sponsor Dave Sample. In addition, six new Paul Harris Fellows and two "multiple" Paul Harris Fellows were recognized. The award of the Paul Harris Fellow is in recognition of a $1000 donation to the Rotary Foundation which supports humanitarian projects world-wide. Barry Vannauker (multiple ), Merkle Cherry, Michele Fina, Evelyn Fletcher, Joyce Thompson, Barbara Nuzzolo's twin grandsons Steven and Mathew Nuzzolo, and Tom Miller (multiple). Lee Nolting, also a multiple Paul Harris Fellow, made the presentations. The incoming Officers and Board of Directors were all in attendance. Axel Augspach (President), Hal Long (1st Vice President), Merkle Cherry (2nd Vice President), Lee Nolting (Secretary), Joe Urbano (Treasurer), and Board Members Andy Thompson, Tom Miller, Ted Fletcher, Dave Sample and Barry Vannauker. Outgoing President Barry Vannuaker talked about "The Work of Rotary" and thanked the club members for their commitment and accomplishments the past Rotary year. Included in the list were the Carnival and Casino Night, the new web site (www.morrisvilleparotary.org), the I Like Me "K" reading program, and the support of the Trenton Soup Kitchen, the Salvation Army ringing of the Christmas bells, the Rotary Foundation, and the YMCA Healthy Kids program. Incoming President Axel Augspach talked about the importance of continuing the Rotary commitment to helping and serving, especially in this time of economic distress. He included in his goals for the club for the coming Rotary year the continuing support of local projects and programs and the support of "Polio Plus", Mosquito Nets for Malaria, the Wheelchair Foundations and Rotaplast (which addresses cleft palates and lips) which are international and Rotary Foundation projects.